LANCASTER COUNTY, Pa. (April 16, 2014) – A new option is making waves in Turkey Hill Dairy’s All Natural Ice Cream line-up, an assortment known for its simple ingredients and backto-basics recipes. The flavor – All Natural Mango – joins an All Natural selection that includes traditional flavors like Chocolate, Vanilla Bean and Mint Chocolate Chip. All Natural Mango is a Limited Batch flavor and will be on shelves from April through June. Just like the ingredients listed clearly on the front of the package, Turkey Hill’s definition of “all natural” is simple – no big words, no long lists. Each option in the eight-flavor line-up is made with only milk, cream, sugar and natural flavors. The result, according to Turkey Hill President John Cox, is a product reminiscent of the desserts the company made when it first started making ice cream in the 1940s. Turkey Hill’s All Natural Ice Cream line-up was relaunched in 2013 with new packaging and a variety of new flavors. Year-round All Natural flavors include Chocolate, Vanilla Bean, Mint Chocolate Chip, Cherry Vanilla, Coffee, Salted Caramel and Vanilla Bean & Chocolate. 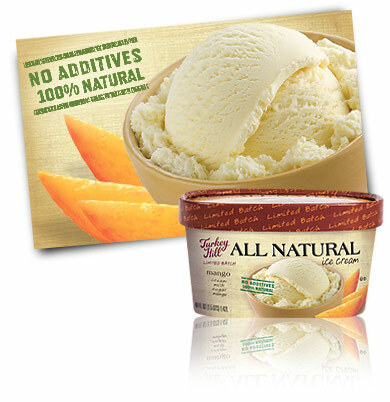 All Natural Mango replaces Butter Almond & Chocolate as the All Natural Limited Batch option. Turkey Hill All Natural Ice Cream flavors are available at select grocers and convenience stores wherever Turkey Hill products are sold. For more information, visit turkeyhill.com.